APPEARANCE: Daitengu are much larger and imposing than kotengu. They usually appear in a more human-like form; usually that of a man dressed in the robes of an ascetic monk, with a red face, an incredibly long and phallic nose (the longer the nose, the more powerful the tengu), and large, feathered wings sprouting from their backs. Only rarely do they appear in the more primitive avian form of the lesser tengu. BEHAVIOR: Daitengu live solitary lives on remote mountaintops, far removed from humanity. Their time is spent in thought, meditation, and perfecting themselves. 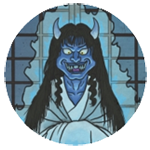 They possess greater pride, wisdom, and power than their lesser tengu cousins. They can also be just as savage and unpredictable, making them potentially much more dangerous. In fact, natural disasters and other great catastrophes are often attributed to the wrath of a powerful daitengu. However, they also possess more self-restraint, and some of them are occasionally willing to give aid to worthy humans. By the 19th century, the warlike nature and vicious demeanor of the tengu came to be seen as honorable traits unique to these powerful bird-like spirits, and their knowledge and skills were popularized in the arts, through ukiyo-e prints, and noh and kabuki theater. From then on, tengu have remained one of the most well-known and loved subjects of Japanese folklore. 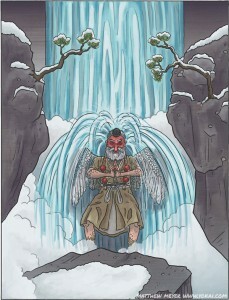 ORIGIN: According to Buddhist lore, tengu are born when a person dies who is not wicked enough to go to Hell, but is too angry, vain, proud, or heretical to go to Heaven. The tengu is a personification of those excessive vices, magnified and empowered in a new, demonic form.